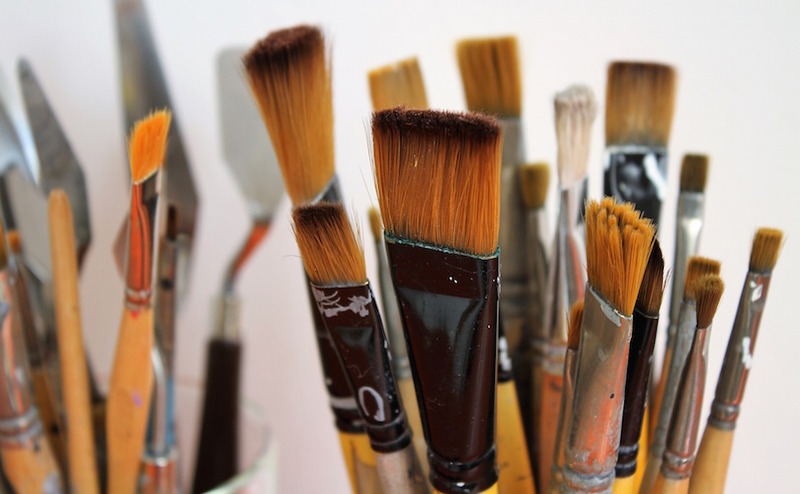 Whether for oil-based or water-based paints, hard, soft, or somewhere in between, get to know your brush bristles and you’ll have a better chance at achieving your desired effect. These brush bristles are best for applying oil-based paints, as natural fibres soak up water and become ‘floppy’. Hog Stiff with natural ‘split ends’, these bristles are ideal for oil painting as they can withstand heavy paint and solvents, and they clean up well. They are typically used to create the ‘big picture’. For example, you could use them to prime a canvas, or to make larger strokes or abstract paintings – they are not great for finer details. Sable These are not made from sable, but from ‘red-haired’ weasels. Sable brushes are softer than other natural bristles, or even synthetic types. You can use them for adding fine detail, making soft strokes, and for blending. They tend to be a little more expensive than hog bristles. Though not very common, natural brushes can also be made from camel, ox, goat, badger, mongoose, squirrel and horse. Known as ‘multipurpose brushes’, these brush bristles can be used with oil-based, acrylic paints and watercolours. Nylon or Taklon (type of polyester) Good-quality synthetic brushes are durable and keep their shape and fibres for a long time. This is because the fibres are stronger than natural bristles and less prone to breakage, which also means these brushes are smooth and easy to work with. You’ll find that Taklon is softer, more flexible and more absorbent than most other brushes. In addition, the bristles are more resistant to solvents, such as turpentine, and cleanup is a breeze because paint doesn’t seem to get trapped within individual ‘hairs’.